The finding of the survey that Protestant churchgoers stick around for theology, not music or preachers can serve as a wake-up call, says the American Pastors Network's to pastors who may be trying to reach people through music, programs or style rather than the substance of the Gospel. "It is crucial that American churches return to the core of the Gospel -- the true focus of who and what the church should be," said APN President Sam Rohrer, Christian Headlines reported. "Today's pastors can get caught up in the style of music, programs offered, the environment and even how leaders dress. "While these things may deserve some attention, they should not be the focus. The foundation of the church must be its theological position and how strongly it is rooted in the Word of God. Rightfully so, the people in the pews realize this," said Rohrer. On the findings serving as a wake-up call, the American Pastors Network's (www.americanpastorsnetwork.net) says pastors may be trying to reach people through music, programs or style rather than the substance of the Gospel. The survey published by LifeWay Research found that most churchgoers will put up with a change in music style or a different preacher. "But don't mess with a church's beliefs or there may be an exodus," according to the study from the Nashville-based research group. The study of Protestant churchgoers found most are committed to staying at their church in the long terms. But more than half said they would strongly consider leaving if the church's beliefs changed. Pastors often worry about changing church music and setting off a "worship war," said Lifeway Research executive director Scott McConnell, noting that few said they would leave over music. Rather, churchgoers are much more concerned about their church's beliefs. "Mess with the music and people may grumble," he said. "Mess with theology and they're out the door." 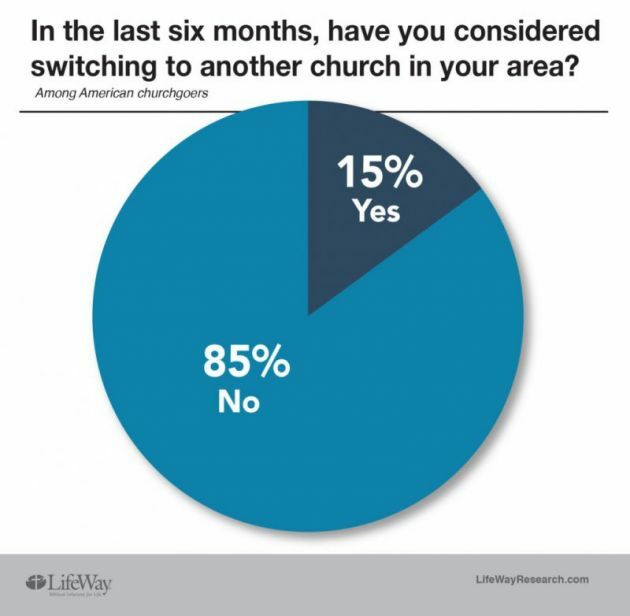 LifeWay Research surveyed 1,010 Protestant churchgoers who attend services at least once a month to see how strongly they are tied to their local congregations. Thirty-five percent have been at their church between 10 and 24 years. Twenty-seven percent have been there for 25 years or more. Twenty-one percent have been there less than five years, while 17 percent have been at the same church for between five and nine years. Lutherans (52 percent), Methodists (40 percent) and Baptists (31 percent) are most likely to have been at their church for 25 years or more. Fewer nondenominational (11 percent) or Assemblies of God/Pentecostal churchgoers (13 percent) have such long tenure. "Most church members have been at their church longer than their pastor," said McConnell. More than half (57 percent) of churchgoers say they are completely committed to continuing to attend their current church. About a quarter (28 percent) are "very much" committed, while 11 percent are moderately committed. Two percent are slightly committed, while 1 percent are not committed at all. The more people go to church, the more committed they are to attending their same church in the future. Those who attend at least once a week are twice as likely to be completely committed to attending their church (62 percent) than people who go once or twice a month (31 percent). Those who attend once or twice a month are more likely to be moderately committed (36 percent) than those who go at least once a week (7 percent). Churchgoers with evangelical beliefs are more likely to be completely committed (67 percent) than those who don't have evangelical beliefs (45 percent). Baptists (60 percent) are more likely to be completely committed than Lutherans (47 percent). "We see many churches today wrestling with what should be foundational beliefs for any church, such as God's definition of marriage, his design for sexuality and gender, and many other cultural and societal issues," noted Rohrer. "While churches must maintain biblical positions on these matters and address them from the pulpit, it is a grave mistake for them to change their foundational beliefs in order to welcome more people, appease more members or otherwise engage the culture."